Yoshida: "US Will Be More Interested In PS Vita Launch"
The PlayStation Vita hasn't proven to be a breakout success in Japan, but Sony expects to see a different result when the device goes on sale in the US next week. Speaking to Venture Beat, Sony president of worldwide studios Shuhei Yoshida said that the device's launch lineup is more in line with US gamers' tastes than those in Japan. "Uncharted, it's a great title, one of the big franchises, but it doesn't really work in Japan," Yoshida said. "SCE Japan marketing is making an effort, so the awareness is going up, but still, Uncharted 3 sold about 200,000 units. It's very small sales compared to Call of Duty...did like 300,000 or 400,000? And that's the biggest-selling game made outside Japan. That's a hard market, when you see something like Monster Hunter selling like 4 million units, just in Japan." By contrast, he said, US gamers are more interested in action adventures and shooters, two types of games that work especially well on the PS Vita. He believes that Uncharted: Golden Abyss, FIFA Soccer, and the upcoming Call of Duty game will bring in US audiences who are looking for a consolelike experience on the go. Yoshida also addressed the PS Vita's launch in Japan, reiterating statements made by Sony's John Koller that the system was selling to forecast. "The sales numbers are within the range that we've been expecting, but they didn't hit the highest, the kind that would have made us ecstatic," he said. 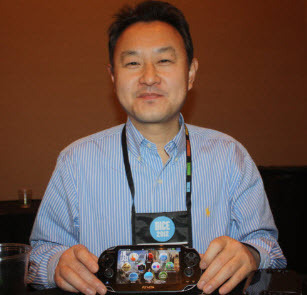 In addition to the aforementioned difficulties with software lineup, Yoshida said that sales of the device have been hampered by the continued popularity of the PSP. As such, he said that Sony is expecting a slower transition away from the PSP and to the PS Vita in Japan. He also said that 3G models of the PS Vita initially heavily outpaced those of the Wi-Fi version "because the core gamers tend to opt for the highest model." This reaction led Sony to "sweeten the deal" for the device's US and European launch, adding in an 8GB memory card, a 30-day, 250MB AT&T DataConnect Pass, and a PlayStation Network game. So then let us know what you think on the PS Vita western sales in the comments below!